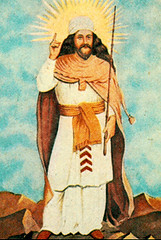 The Prophet Zarathushtra lived and taught in ancient Persia. While the exact date of the Prophet’s birth is still a matter of scholarly debate, some believe he lived as early as 1750 BCE. He was known to the ancient Greeks as “Zoroaster,” and taught of one supreme God, Ahura Mazda, or “Lord of Life and Wisdom.” His divinely revealed, ethical message of monotheism, advocating individual reason and intelligent action, was revolutionary for a society that worshipped a pantheon of deities and was ruled by corrupt local princes and religious authorities. The new faith, referred to in the ancient scriptures as “the Good Religion” (Gathas, Yasna 44:10, 53:1) taught a basic moral dualism—a conflict between good and evil in which human beings have both the freedom to choose and the responsibility to bear the consequences of their choices. 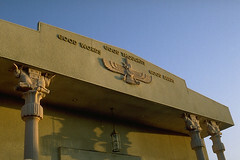 Scholars point to the influence these teachings have had in other ancient religions, such as Christianity and Judaism. The religious literature and commentaries on Zoroastrianism were extensive and written in several languages, including Avestan, Old Persian, Pahlavi, Persian and Gujarati. Unfortunately, much of the ancient religious literature of the Zoroastrians has been lost. Based on historical records, an estimated three-fourths of the religious literature of the Sassanian era (224–652 CE) was destroyed in the wake of invasions and persecutions. The Avesta is the oldest surviving religious book, and is comprised of five parts: the Yasna, containing the Gathas; the Visperad, covering festival observances; the Yashts, or hymns of praise; the Vendidad, a book of ancient purity laws; and the Khordeh Avesta, or the “smaller Avesta” containing the daily prayers. The hymns of the Prophet Zarathushtra, called the Gathas, were orally transmitted by his followers and represent the Avesta’s oldest and most sacred teachings. The five Gathas incorporated within the Yasna consist of seventeen divine hymns. Many scholars of Zoroastrianism and leaders of modern-day Zoroastrian communities emphasize the centrality of the Gathas‘ teachings, which are considered the most authentic expression of the faith. Gathic principles include warnings against excessive ritualism and an emphasis on the importance of human reason and ethical behavior as a “co-worker” of God. According to the teachings, although the one supreme and infinite God—Ahura Mazda—cannot be fully understood by humanity, six attributes of Ahura Mazda were revealed to Zarathushtra. Known as the Amesha Spentas, they include Vohu Mana, the Good Mind; Asha, the divine law of righteousness, justice, and truth; Kshathra, the majesty and power of good dominion; Armaity, Ahura Mazda’s love and benevolent devotion; Haurvatat, well-being and perfection; and Ameratat, immortality. Humans must strive, both through reason and action, to emulate these attributes of God to live a good life. These ideals are equally available to all of humanity, both female and male. But they can only be attained by living a balanced life of ethical thoughts, words, and deeds. Indeed, the practical and rational nature of Zarathushtra’s ethical teachings is illustrated by the faith’s central triad: humata (good thoughts), hukhta (good words), huvarashta (good deeds). Today, this three-phrase motto is both the likely response of many Zoroastrians asked to explain their faith and the concept many of them seek to live out through their everyday lives and philanthropic works around the world.